Locking the ball nut in place. Adjusting the ball nut preload. VERY IMPORTANT: Over tightening will cause set screw not to rotate. DO NOT over tighten. 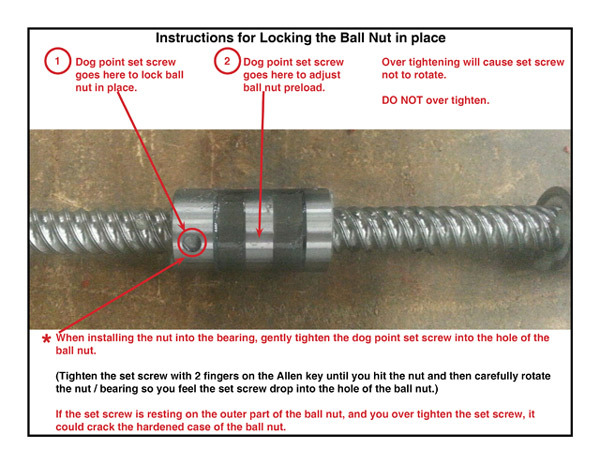 When installing the nut into the bearing, gently tighten the dog point set screw into the hole of the ball nut. (Tighten the set screw with 2 fingers on the Allen key until you hit the nut and then carefully rotate the nut / bearing so you feel the set screw drop into the hole of the ball nut.) If the set screw is resting on the outer part of the ball nut, and you over tighten the set screw, it could crack the hardened case of the ball nut.